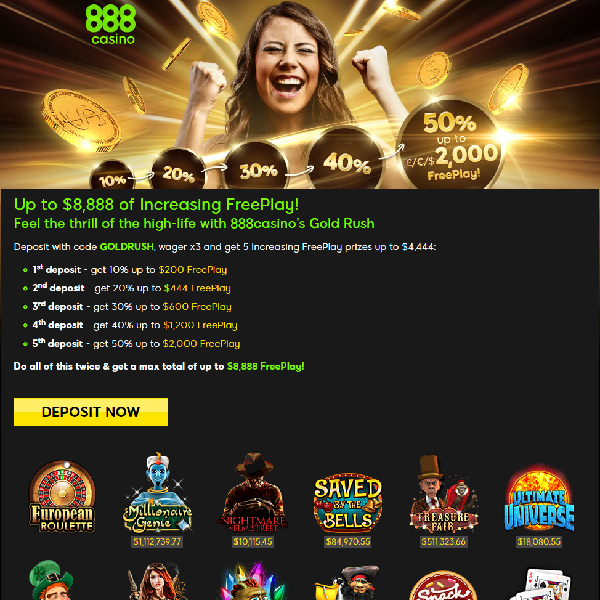 888 Casino is giving members the chance to claim up to $8,888 of increasing Free Play in its latest promotion. All you have to do is deposit with the code ‘GOLDRUSH’ and you will receive five increasing free play bonuses. The first deposit awards 10% up to $200, there is 20% up to $444 on the second, 30% up to $600 on the third, 40% up to $1,200 on the fourth and 50% up to $2,000 on the fifth. You can then do it all again and enjoy a maximum of $8,888 in free play. The free play can then be enjoyed on a number of top games such as European Roulette, Multihand Blackjack, Millionaire Genie, A Nightmare on Elm Street, Saved By the Bells, Treasure Fair, Ultimate Universe, Irish Riches, Steampunk Nation, Jack’s Pot, Pirates Millions and Snack Times slots.